Allie is an oil painter and mixed media artist, creating her signature 24k Gold Leaf Landscapes out of her studio in Hagerstown, Maryland. She graduated from St. Mary's College of Maryland in 2011, with a Bachelor of Arts in Art & Art History, and a minor in Mathematics. This juxtaposition of the creative and analytical has shaped her into a Type-A artist who thrives off of challenging both sides of her brain, pushing the limits of her palette and paintbrush, and exploring strategy as a small business owner. Her paintings dwell in homes and collections internationally, across 5 continents. (Africa and Antarctica are next!) When she's not in her studio, she can be found blowing raspberries into her baby's scrumptious belly rolls, tending to her family's organic garden with her husband Mark, and slowly remodeling their fixer-upper and designing their forever home. Allie’s work is about hope - weathering the literal and metaphorical storms, and seeing the light at the horizon. Aesthetically, drawn to the contrast of dark, moody skies, against the rich glow of 24 karat gold leaf. Her landscapes live somewhere between abstract and real, a particular vagueness intended to challenge the viewer to discover the image on their own terms, applying their own histories and memories onto the piece. 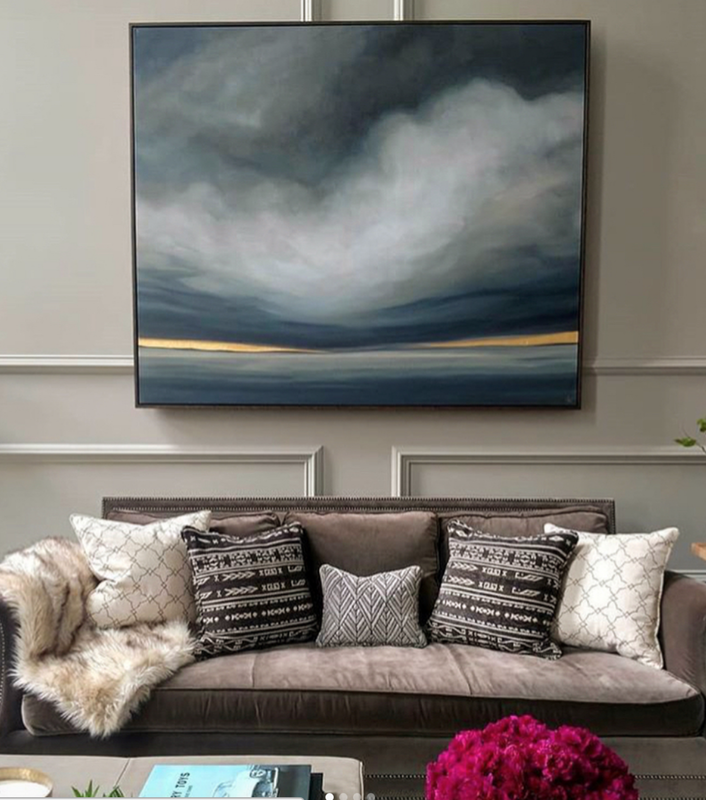 Allie releases seasonal collections of original gold leaf landscapes — oil and 24k gold leaf, typically on gallery-wrapped canvas and occasionally on wood panel. Click the link below to shop available pieces. 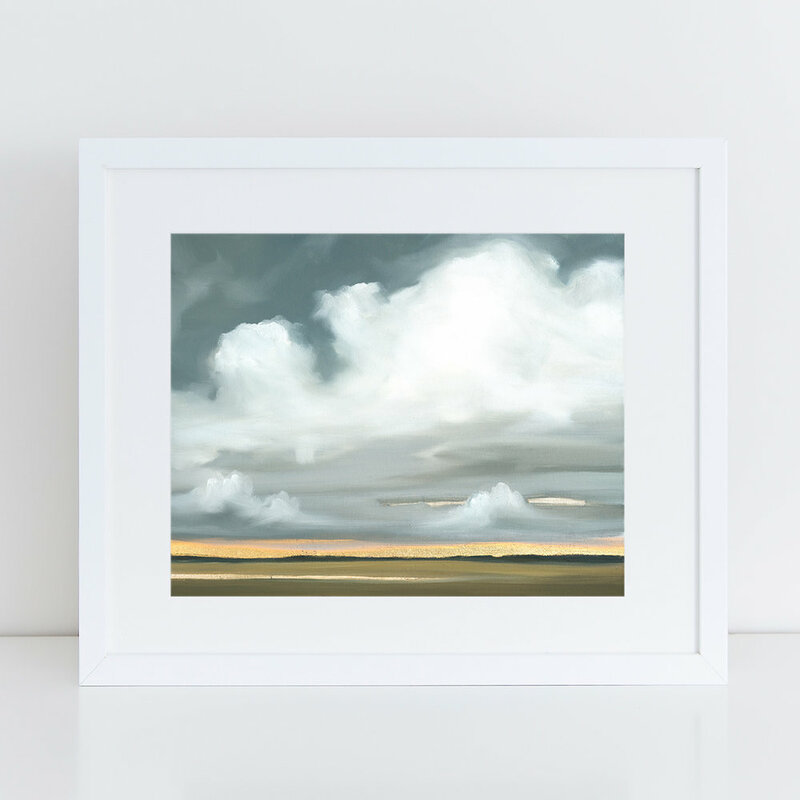 Premium, archival giclée prints on fine art canvas available in THE PRINT SHOP. Particular paintings are only available as prints for a limited time, retiring after a few months. All fine art prints are trimmed by hand in our studio, varnished with a satin finish, and signed in gold ink by the artist. Interested in commissioning your own custom gold leaf landscape? Allie is accepting a limited number of custom projects. Click the link below to learn more about the process, and get the conversation started. And get 10% off your first print order! To get first access to shop Allie’s new collection of originals, receive exclusive coupon codes, and be “in the know” for all of the exciting happenings in the studio — sign up below to join the e-mail list. We take your privacy very seriously, and promise to never spam you! Use the code RAININGGOLD for 10% off your first print order!